I’m sorry I have not been able to keep up with this blog daily throughout the conference. We advocates are truly busy here….I attended I think 8 scientific presentations yesterday, then we had an event in the evening, so my day from about 7AM to 10PM was accounted for. I needed to get up early again this morning for another long day (and will again tomorrow morning) so haven’t had time to blog much. But I will be back with updates about what we’ve learned here as soon as I can. It’s interesting, most of the advocates I meet here are strangers from all over the country, but our cancer and advocacy experiences bond us. We communicate easily with each other and feel an almost instant friendship. I ate dinner last night with three advocates from other parts of the country who were strangers to me the day before. We had a great time and had no trouble finding things to talk about. We were talking again today. Cancer changed our lives. And our lives never returned to our previous before-cancer normal once we finished cancer treatment and became “survivors”. We are all long term survivors doing purposeful and good things with our cancer experience, but we agreed that if we could go back to our old before-cancer lives and perspectives, when we weren’t survivors and advocates, we would. If we could, we’d in a minute go back to the lives we had before that had not yet been corrupted by cancer, by cancer testing, by uncertainty and by loss. We all still miss the old before-cancer days, when we didn’t feel so vulnerable, when we didn’t live in a world that witnessed so much hurt and struggle, when we didn’t so often lose other survivors we’d developed friendships with, when we didn’t have to constantly be tested to find out if we could continue to expect to survive. Life even after cancer, as a survivor, is tough. But the whole point of this conference is cancer research, learning how we can one day help make cancer disappear from the face of the earth. Hoping for a day when no one has to contemplate their lives before and after cancer. Our grand hope; cancer cured and a thing of the past. A time when there are no more cancer survivors because there are no more cancer victims. I spent today with the other advocates involved in the AACR’s Scientist-Survivor Program. The survivors and advocates, about 30 of us altogether, are from all over the US and the world. There are Scientist-Survivor Advocates in the program from Jordan, Zimbabwe, Poland, Sweden and Canada along with advocates from all over the USA. All of the advocates have had their lives affected by cancer and have gone on to do great things on so many levels. I feel I have done very little in comparison; the other advocates have done so many things that have made such a difference and have contributed so much to those affected by cancer. They so inspire me. I hope to grow to their levels of advocacy. The Scientist-Survivor Program was the brainchild of scientist Anna Barker, the deputy director of the National Cancer Institute. The program seeks to help those of us who advocate for others learn what is new in the world of cancer research so that we can share what we learn with those in our respective communities. What we learn from the scientists and what they learn from us will help us to form mutually supportive relationships that will in the end benefit us all. There were several scientists I met last year who came to spend time with us today and who gave us hugs, sat at our tables and joked with us. Prior to my involvement in this program, they wouldn’t have been real people to me, just first initials and last names on research journal articles I might have read as a medical professional and patient. Now I know better, they are real people who care about those of us with cancer and who want to help us defeat our disease. Now they are my heros. Maybe some of our success stories will inspire the scientists to keep doing the good work they are doing. The comment was made that cancer research is difficult work, that the work involves 98% failure and 2% success. Cancer is a tough and complex disease. I wonder how many of us would stay with a job where we only felt we succeeded at what we were doing 2% of the time. And what if most of our work and even our successes were not recognized by the world at large? What if we had to beg for the funding that would allow us to continue to do our job? I’m sure we would become discouraged. At least as a nurse, even if my patients die, families thank me for my caring. I get personal positive feedback for my work, at least sometimes. More than 2% of the time. But those of us who are long-term survivors have survived as a result of the scientists work. The only chance the world has of ever seeing an end to cancer is the scientists continued dedication to the field. I am an almost 8 year survivor of an “untreatable” cancer, another advocate I spent time with today is a 5 1/2 year survivor of pancreatic cancer. We have survived as a result of the research that led to the treatments we received. I believe, as the SSP Program does, that scientists and advocates can learn from each other and form mutually supportive relationships that will result in newer and better treatments, and in the end a cure for cancer. Anna Barker did a wonderful presentation for our group today, I truly admire her. She lost most of her family to cancer and as a scientist has dedicated her life to ending cancer in her work with the National Cancer Institute. She gave us some mind-numbing statistics. Cancer results in $213 billion dollars a year in US health care costs. Currently 560,000 people in the US die of cancer ever year. As cancer rates increase as the baby boomers age, cancer will result in 10.3 million deaths every year. As a country our cancer death rate is expected to double by the year 2020. The really sobering statistic, though, is that the overall number of deaths from cancer has not decreased since 1950. Our five year survival rates have increased, so people are living longer after a cancer diagnosis, but the cancer death rate per 100,000 population is the same now as it was in 1950. We’ve reduced the overall death rate from cardiac and other causes, but not cancer. I’ve always been afraid that when people hear the numbers indicating increased 5 year cancer survival they will feel we are winning the battle. The battle is a long way from being won. I think people came to associate “5 year survival” with “cure”; that is not the case. Many are living prolonged lives with cancer, but in the end are not surviving their cancer. We still have a lot of work to do. We still need to devote a lot of resources to cancer research. The good news is that there are many new ground-breaking research findings, and new out-of-the box areas of cancer research, which combined with new technology and communication abilities have the potential to truly change the cancer statistics in upcoming years. Nanotechnology, cancer genomics, angiogenesis studies, and proteomics are just some of the new areas of cancer research. We are thinking differently now, and I think we will see great progress and success in the fight against cancer soon. I will spend all day tomorrow listening to scientific presentations discussing new discoveries and hope to share some of them with you tomorrow.
. 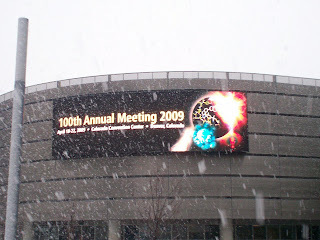 I am in Denver now ready for the beginning of the AACR’s Centennial Annual Meeting tomorrow. There will be 17,000 people participating in the conference from 60 different countries with over 500 significant new discoveries in cancer research being presentedI am tonight trying to decide which of those 500 presentations I most want to attend, I wish I could attend them all. I again have multiple presentations, at least 2 or 3, I’d like to attend for most of my available time slots over the 5 days. I will again have to pick and choose as I am unfortunately unable to be in several places at once. It is such an overwhelming opportunity for me to learn so much. I am very grateful to be here. I flew into Denver just before the snow storm started…it was pouring rain when I got here and about half an hour later the rain changed to sleet and then heavy snow. 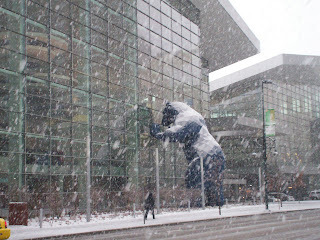 I was able to get a few pictures, one of the snow covered Big Blue Bear sculpture that peeks into the Conference Center windows. It is 40 feet tall and weighs 10,000 lbs. You can see the snow storm as it was in progress. I’m very fortunate my flight came in when it did…an hour later and I’m sure I’d have experienced flight delays. I will try to update my blog over the next several days while I am here in Colorado. I will be leaving tomorrow to attend the American Association for Cancer Research’s 100th Annual Meeting in Denver, Colorado as part of their Survivor-Scientist Program. This is the second annual meeting I will be attending, and my third AACR conference. I attended their Prevention conference the end of last year in addition to their annual conference last April. Last year’s annual meeting had such a profound impact on me. I’m not sure what I had expected prior to going last year…it was the first oncology conference I’d ever attended (okay, my first medical conference ever). I was overwhelmed by the number of people attending the conference…thousands and thousands of scientists. So many scientists, all passionate and dedicated to eliminating cancer from our world. Scientists who were real and caring people, all devoted to seeing an end to the devastation cancer brings to our lives. Exceptional people with many years of education who have dedicated their brilliance, their time, their passion and their lives to seeing an end to cancer. It gave me such hope; it made me know that many people care about us and our struggle. I for the first time in my medical career saw the faces behind the scientific journal articles I’d always read. Real people with spouses and kids and a sense of humor. People I could have lunch with, have a conversation with. It made me know that many people care about seeing an end to the pain and terror cancer brings to our lives. They are learning so much that will one day help us. And I met so many other survivors who were also advocates, who had done so much. I so wanted to emulate their advocacy, I wanted to make a difference to other cancer patients, as they did. I was inspired in so many ways. How I got involved in the Scientist-Survivor Program is a kind of fun story. A woman who had seen my web site emailed me. I’m not sure how she came to find my site as she is a long term kidney cancer survivor, not an appendiceal cancer patient. She wrote me to say that my advocacy efforts reminded her very much of the efforts of a friend of her, a kidney cancer survivor who founded the Kidney Cancer Association based out of Chicago, but who had later succumbed to the disease. She’d participated in advocacy efforts through that organization and gone on to become very influential in advocacy efforts on a state level. It turned out she lived in a town only 30 miles from me, so strange as via the Internet I’ve comunicated with cancer patients from all over the world since publishing my site. Not only were we neighbors, we were about the same age. We traded phone numbers and talked for hours several times…we truly connected and developed a great respect for one another. She had participated in the AACR’s Scientist-Survivor Program years before and said she wanted badly for me to become involved with the program. She sent me a link to an application to the program, said that a recommendation letter was required and that she wanted to write my recommendation letter. She asked me to please apply. So, I filled out the application, not really knowing what I was applying to, sent the recommendation letter and waited to hear if I’d been accepted. About the same time I sent the application, I’d received another email from a woman who wrote for CR Magazine, a new cancer magazine I was unfamiliar with. She had a cancer blogger column and asked if I’d be willing to be interviewed and for my blog to be the subject of one of her columns. I was very flattered and accepted. During the phone interview, I discovered the magazine was a journal of the American Association for Cancer Research…the same organization who sponsored the Scientist-Survivor Program. As it turned out, the editor of the magazine was also the Survivor and Patient Advocacy program director for the AACR; she was in charge of the Scientist-Survivor Program. The columnist for the magazine didn’t know I’d applied to the Scientist-Survivor Program. Just a coincidence. In the end I met the editor of the magazine, Gwen Darien, a woman I truly admire and who is a cancer survivor also, when I attended my first AACR annual meeting. Such a cool sequence of events. I’ve had an overwhelming number of those kinds of coincidences since first deciding to advocate for my cancer. In the end, I really don’t think they are coincidences…I think I’m on the path I’m meant to be on. I am grateful for the purpose an initially terminal cancer diagnosis, though an experience horrible beyond words once, has given to my life. I’ll try to write here from the conference over the next several days. Chicago to Denver tomorrow! Stay tuned! Having to face and think about “End Times” so many times during my journey with cancer (the 14 CT scans and many tumor markers and tests over the past 8 years) has made me truly have to contemplate what happens after we die. I’ve had to investigate just what I believe about life after death. I was raised in the Christian church, but that in itself was not enough for me to choose Christianity as my religion…I’ve investigated several religions including Hinduism, Buddhism, Taoism, Islam and Atheism in recent years (I believe even Atheism is a religion and requires a certain faith). I’ve read lots of books and tried to decide in an intellectual manner what I believe, what makes sense to me. I love that the minister of our church now said that he came to doubt Christianity and to research other religions for awhile even while he was the leader of our church. A religion or belief system you can’t challenge and doubt and question, in my book, isn’t worth believing in. So I’ve challenged, doubted and questioned. I’ve read so much about so many religions. Lewis Thomas is my very favorite author; I own all of his books. If I were dying and could “Make a Wish”, it would be to attend a lecture of his…but alas, I learned he died in 1993. Lewis Thomas was a brilliant Harvard educated biologist and physician who was always “perpetually startled” by what he found in nature. He contemplated the symbiosis he discovered in nature, the things he discovered that were unexplainable. The critical mass of termites. He contemplated the miracles all around us every day that we take for granted. I love to be out in nature and to observe. In the end I think being in the woods has most convinced me that there has to be an intelligent designer of our universe, a God. Lewis Thomas’ Seven Wonders and other writings of his about nature have been some of my most “religious” texts. And nature has become my best “church”. When I read of his discoveries, I have to believe they couldn’t have happened by accident. There has to be a God. After I decided there had to be an intelligent designer, a God, my search led me to Christianity as the one religion that had the most evidence of being true. And the cool thing is, Christianity is the one religion that says we remain who we are after death, our physical life continues. We don’t cease to exist when we die. And Christianity says that after death we are no longer bound by the laws of physics, and that we will never again face death. I’ve thought about reincarnation…if I become someone else with no memory of who I am now, then essentially I cease to exist after death. And the me who would be someone else would have to face end times, death, and the fear of death and loss, over and over again. I really, really don’t want to do that, to go there. If as in some religions I become part of a universal consciousness when I die, a drop in a sea of consciousness as some believe, then I also cease to exist as the individual I am. Christianity lets me always continue to be me. I love that. I get to save the progress I’ve made so far, see the people I’ve loved who’ve left before me, cherish the lessons I’ve learned and continue to grow. And as a Christian, I don’t believe we will spend our eternity in an eternal church service or on clouds playing harps. I truly believe our eternity will be spent active and purposeful, that we will do what we are most suited for, that we will be who we were always meant to be. That we will always be growing and learning and evolving. That we will eat and love and hug. So in the end, my search led me to believe that the very hard and difficult “End Times” I have written about for awhile now will have a purpose, they will lead us to where we have always been meant to be. We will finally go home when we die. Death won’t be an end, it will be our beginning. We only have to make that transition once, then death will be forever defeated. The pains we feel now are the labor pains, the birth pains, that will transition us home.